CLICK HERE TO OPEN AN ACCOUNT AT FANDUEL NOW! Welcome to our review of Fanduel, the best daily and weekly fantasy sports site on the web! Draft a team today, get paid tonight when the games are over! One day fantasy sports leagues are recreating the way the game is played and there is nothing more exciting! This is where WE play! Fanduel is open to US Players with exception of Arizona, Iowa, Louisiana or Montana who's state laws don't allow daily fantasy sports. Canadian players are also allowed. Fanduel has been kind enough to work out a special deal with our site that allows us to offer RotoPicks readers a special 100% signup bonus up to $200 in free bonus cash on your 1st deposit! (Enter promo code: ROTOPICKS) Simply sign up through the link above and the bonus will be applied to your account. As with all daily fantasy website bonuses, your bonus cash is credited to your account in a time released fashion as you play. Deposit bonuses release in increments of $1 for every 100 Frequent Player Points (FPPs) that you earn by playing in paid contests. All deposit bonuses expire four months after they are created. Fanduel Points (FDPs) are points you earn upon the start of every paid contest you enter on Fanduel.com, whether you win or lose. FDPs awarded vary per contest type are not earned for playing in FREE ENTRY games. The more contests you join and money you spend, the more FDPs you earn, which are used to enter special freerolls. Fanduel fantasy sports caters to both the novice and pro fantasy player. You can play for free in their freerolls (which offer prizes) to get a feel for the site, or play for real money for as little as a $1 entry fee or all the way up to highroller action of $5,300! Fanduel offers daily and weekly leagues for NFL football, NCAA football, NBA basketball, college basketball, Major League Baseball and NHL. You can play in leagues as small as head to head all the way up to thousands of players in Guaranteed Prize Pool Leagues (GPP's). Types of leagues vary including but not limited to: large guaranteed prize pool salary cap leagues, head to head, 50/50 (aka Double Ups), and more. Our favorite leagues are the double up leagues where you only have to finish within the top 50% to cash! FANDUEL.COM - CLICK HERE TO SIGN UP! Deposit Options: Paypal, Visa, other credit cards via PayPal. Payouts are made via Paypal/Check and are FAST! Minimum League Entry Fee: Offers free games. Cash games start at $1.00! Rewards Program: Offers Fanduel points (FDP) for your play. FDP are used to enter FDP freerolls which give away over $15,000 cash per month. More Reasons to Open an Account at Fanduel: Weekly freerolls - The Weekly Open Freeroll is open to all users, has no entry fee, and rewards $1,000 in prizes. There is also a New Depositor Freeroll each week for new depositors in that week. There are also $1,000 in prizes in this freeroll. 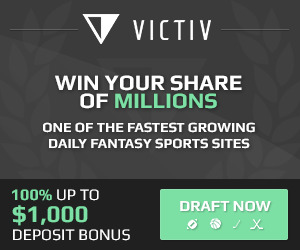 Deposit bonuses release as free cash at a rate of 4% of every entry fee you pay. 50 finalists will be flown out to the Ritz-Carlton in South Beach, Miami for the $1,000,000 World Fantasy Basketball Championship!